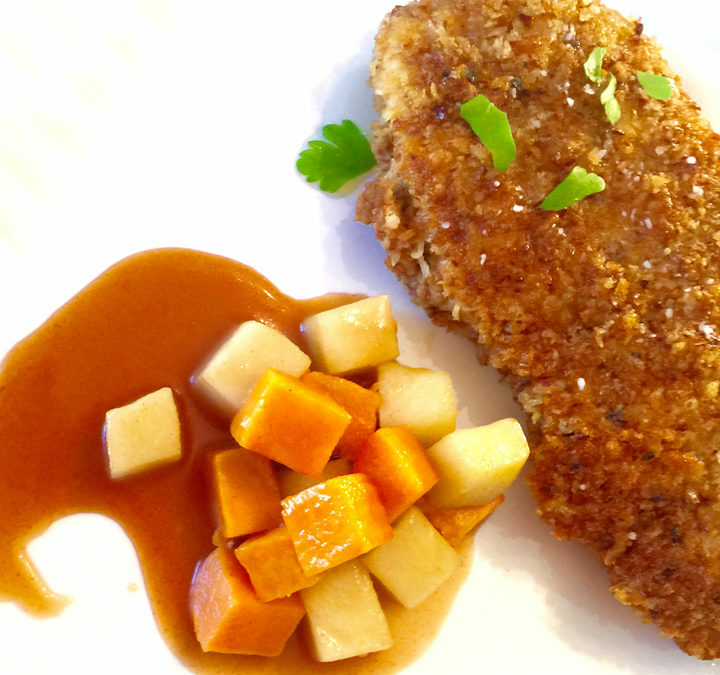 Crispy, sweet and nutty – a delectable combination for chicken cutlets. Our recipe coats chicken in ground pecans, Parmesan cheese and panko breadcrumbs then sautés them to perfection. For a delicious contrast, the savory sauce combines honey, lemon, and bourbon. Add some extra flavor with roasted apples and sweet potatoes – lightly tossed in the sauce right before serving. To make the sauce, combine the lemon juice, brown sugar, honey, butter, bourbon, cinnamon, ginger and 1/4 teaspoon of kosher salt in a saucepan, heat to a simmer and cook 10 minutes. Turn the heat to very low, cover and keep warm. Place plastic wrap over the chicken cutlets and pound them to 1/4″ thick. Set up a three tray breading station: in the first tray combine the flour with 2 teaspoons of kosher salt and ½ teaspoon of pepper, in the second tray add the eggs with 1 tablespoon of water and whisk until combined, in the last tray combine the panko bread crumbs, pecans, and Parmesan with a pinch of salt. Heat a large sauté pan over medium high heat. Add 1/3 cup of neutral flavored oil and heat until shimmering. Dip the cutlets in the flour, coat well, then shake off any extra before you move to the egg. Dip in the egg, shaking off any extra before adding to the panko, pecan and Parmesan mixture. Coat well, shake off extra and add to the oil. Sauté for 1-2 minutes per side until browned and the chicken is cooked through. Continue with all the cutlets, adding any extra oil if needed. Place the cooked cutlets on paper towels for 2-3 minutes, then move to a platter. Top with a sprinkle of sea salt and serve with the sauce. For an added treat, roast some diced apples and sweet potatoes. Start by preheating the oven to 350 degrees. Cube two green apples and one sweet potato. Toss in one tablespoon of neutral flavored oil and one teaspoon of salt. Place the sweet potatoes and apples on a sheet tray covered with parchment paper and roast 25-30 minutes until tender. While warm, toss them in a small amount of the sauce and serve with chicken and extra sauce on the side.